We had the pleasure of reviewing one of the newest Bratzillaz, Meygana Broomstix. My daughter absolutely love Bratz dolls and I think I was more excited to see her reaction because I knew this was coming before she did and she had just seen the commercial for Bratzillaz maybe a couple of weeks before it came and had already added this to her Christmas list for Santa. Her first reaction was jumping up and down screaming and thanking me. Once she opened the doll she went in her room and played with the doll for a couple of hours. She loved that she could introduce her Bratzillaz doll to her Monster High dolls and create an even bigger school of monsters (what she called it). My first reaction was that this was a really cute and new version of the Bratz dolls. I love that the Bratzillaz dolls all have their own unique style along with their own pet, which wasn't included, but we're hoping Santa will leave Wingzy (Meygana's pet) in her stocking this year. 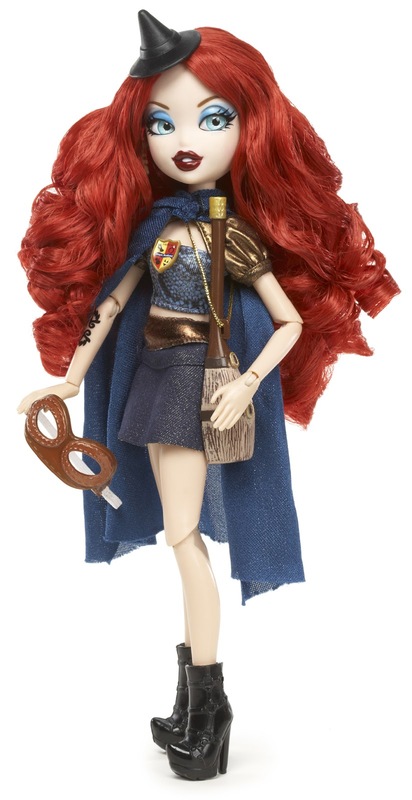 Also included was her broom shaped brush, which I thought was super adorable and a masquerade mask, which fits her style perfectly! I also love that they have their own website where you can go and play games, view the other dolls and watch the new videos of their new cartoons as well. These dolls are definitely wickedly awesome and match up perfectly for Halloween! Check out their music video below, which my daughter has been listening to every morning before school for the last week! Disclosure: All opinions are my own. I received a Bratzillaz doll at no cost for the purpose of this review. No other compensation was received.